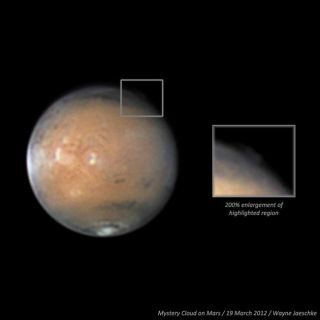 Mystery cloud on Mars photographed last week. Inset shows slight detachment of cloud from limb. The amateur astronomy community is abuzz over a strange phenomenon spotted over Mars last week. Astrophotographer Wayne Jaeschke reports on his website of a "strange feature" over the Martian plain called Acidalia that moves with the planet and seems to rise over the limb. The discovery has professional astronomers taking note. NASA's Mars Odyssey spacecraft will try to image the cloud with a camera that can take pictures in visible and infrared light simultaneously. "Our atmospheric researchers are pretty excited about the possibility of not only getting a good look at the cloud structures, but also their temperatures," Arizona State University astronomer Jonathon Hill tells MSNBC.com. Whatever it is — or was — the feature is diminishing in size. "This has led some to believe that it was some sort of transient-type event," Jaeschke told MSNBC. The list of culprits includes a dust cloud from a meteorite impact, a massive storm system or just a trick of light.